A soccer cake is the perfect cake for an end of season soccer party, soccer birthday party or Father’s Day gift. This easy-to-make soccer cake was made for my daughter’s party at the end of her soccer season. With a soccer ball cake pan and Wilton star tip #21 or #18, you can easily create this cake. Generously grease soccer ball cake pan and 12-inch round cake pan. Prepare recipes and bake according to directions. The soccer cake pan will hold 1 recipe and the 12-inch cake pan will hold approximately 2 recipes. After cakes are finished baking, allow to cool on wire rack for 15 minutes. Remove cake from pans and cool completely on wire rack. While cakes are cooling prepare cake boards by covering with Fanci-foil wrap or green fondant. When cakes are completely cool, place the 12-inch cake on cake board. Crumb coat cake and allow to stand for 15 minutes, until icing crusts over. Ice cake with green frosting. Ice the sides of the cake smooth. 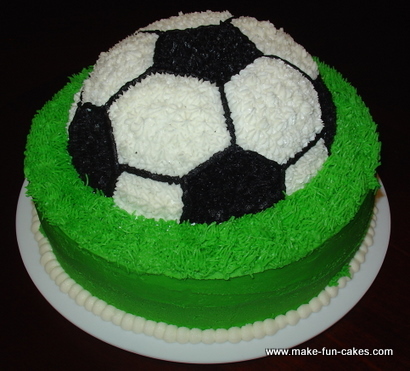 Since the soccer ball and grass will cover the top only a light layer of icing is needed on the top. Take the smaller cake board and center it on the top of the 12-inch cake. Roughly outline the board with green icing. Remove cake board. Now place the soccer cake on the cake board. You should see the hexagon shapes clearly on the cake. Fill a decorating bag with black icing and round tip #6. Outline the hexagons on the cake. Remove tip #6 and replace with star tip #21. Decide which hexagons you wish to be black. Look at a soccer ball or picture of cake. Using the star tip, pipe stars back and forth until the hexagons are filled completely. Fill another decorating bag with white icing and using a clean star tip #21, pipe stars back and forth until the rest of the hexagons are completely filled. 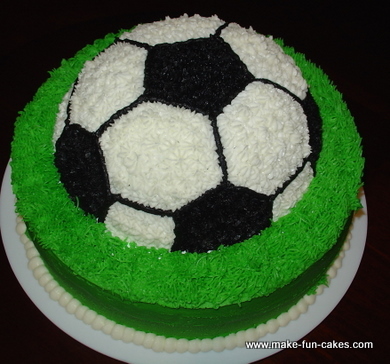 Your cake should now look like a soccer ball. If needed, outline the hexagons again with black frosting and tip #6 to give the cake a crisp look. Stick a wooden dowel in the center of the 12-inch cake and mark the spot where it comes out of the top of the cake. Remove the dowel and cut it to the right size. Measure and cut 4 more dowels. Place the 5 cut dowels in the center of the cake to support the soccer cake that will be placed there. When dowels are in place, center the soccer cake on top of the 12-inch cake, using the outline you made earlier. 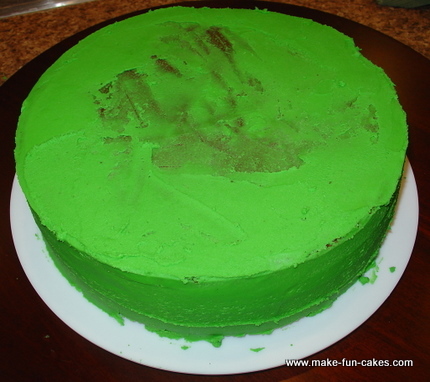 Using tip #233 and the green icing, pipe grass on top of the 12-inch cake that is not covered by the soccer ball. It should look like the soccer ball has landed in the grass. Using tip #12 and white icing, finish off the cake by piping a round border around the bottom of the 12-inch cake. 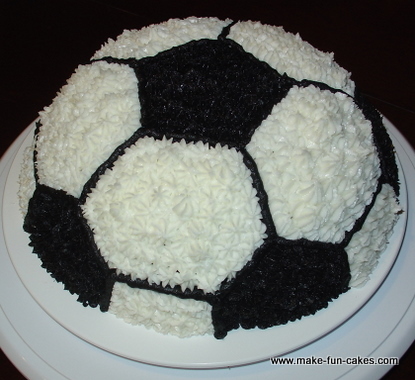 Congratulations on your soccer ball cake. This is a fairly simple cake to make, yet it looks great. You can always personalize the cake by writing a message on the cake board or adding the soccer team’s colors to the border.